2010-03-23 Application filed by Lesieur S.A.S. filed Critical Lesieur S.A.S. The present invention relates to a food composition in the form of an oil-in-water emulsion, capable of being stored at room temperature, including phytosterols in a free or esterified form and oils that are naturally rich in omega-3 fatty acids, and which is low in salt. The present invention relates to a food composition and its use to reduce the risk of cardiovascular disease. Among cardiovascular risk factors, high cholesterol and high blood pressure are two main factors recognized. However, it is recognized that this rate of LDL cholesterol can be reduced by dietary approach aimed at reducing the consumption of saturated fats (meat, whole milk, butter and dairy products), to enrich the supply of essential fatty acids like Omega 3 (vegetable oils, fatty fish) associated with the consumption of foods with added phytosterols. (Van Horn et al, J. Am. Diet Assoc. 108, 287-331, 2008). Phytosterols are plant compounds whose chemical structure is similar to that of the animal cholesterol. The animal cholesterol and phytosterols have similar functions in the organism (cell constituents, precursor of certain hormones ....). Phytosterols are already known in the art for their ability to lower LDL blood cholesterol levels. Because of their close chemical structure, phytosterols limit the absorption of cholesterol in the intestine occupying absorption sites of the latter. For over 50 years, numerous studies have highlighted the role and interest of phytosterols in treating hypercholesterolemic patients. Similarly, Berger et al. (Lipids Health Dis. 3, 5. 2004) observed a reduction of 12-16% blood LDL cholesterol in subjects after daily consumption from 1.5 to 2.0 grams of free phytosterols or equivalent free phytosterols for several weeks. . Through these many clinical findings, EFSA (European Food Safety Autority - European Food Safety) recommends consumption of at least 2g of phytosterols in dietary cholesterol treatment approach. The term phytosterols (present in free or esterified form) refers specifically plant sterols from natural sources, whose composition is specified in the decisions of the Commission authorizing the placing on the food market with added plant sterols under Regulation (EC) No 258/97. The phytosterols include plant sterols and stanols. Plant stanols occur naturally in certain plants and can also be obtained by hydrogenation of sterols. As phytosterols which may be mentioned by way of example campesterol, stigmasterol, β-sitosterol, brassicasterol and the ergosterol. Phytosterols are particularly present in the soybean oil, corn oil, sunflower oil and rapeseed oil. Phytosterols are present at a level from 0.1% to 0.5% in vegetable oils. In some concentrated oils, such as those described in EP 1280420, the content of phytosterols can reach 10%. However, although naturally in certain plants, their concentration in food is far from sufficient to allow a significant effect on LDL-cholesterol. To benefit from a cholesterol-lowering effect, it is recommended to consume foods with added phytosterols. Omega-3 fatty acids are polyunsaturated fatty acids whose first double carbon-carbon bond is 3 carbons (n-3) the methyl end, that is to say the third connection from the termination methyl of a fatty acid. Omega-3 fatty acids are essential fatty acids and essential as they play important physiological roles during human development and throughout life. For example, the brain, which is the organ most rich in essential fatty acids (after the adipose tissue and the retina), needs a sufficient amount of omega-3 fatty acids to maintain its normal functions, such as cognitive function and behavioral function. Omega-3 fatty acids are in fact a family of fatty acids: α- linolenic acid (C18: 3 n-3) or ALA, eicosapentaenoic acid or timnodonic (C20: 5) or EPA, and docosahexaenoic acid or cervonic (C22: 6 n-3) or DHA ,. In the human body, ALA can be converted to EPA and DHA, but our body can not synthesize de novo ALA. Consequently, omega-3 fatty acids in the human body exclusively derived from diet. Omega-3 fatty acids are found in high levels in certain fatty fish (EPA and DHA), or in vegetable oils such as rapeseed, soybean, wheat germ, or camelina (ALA). The essential role of omega-3 fatty acids on health is now clearly demonstrated. Indeed, strong clinical data show that omega-3 fatty acids may reduce the level of blood triglycerides (Harris Am J Clin Nutr 65 (5): 1645S, H. Davidson et al, Clinical Therapeutics 29 (7): 1354- 1367) and reduce the risk of secondary and primary heart attack because of their blood thinning properties and their beneficial effect on the arrhythmia. It is already recognized that the omega-3 fatty acids and omega-6 have opposite physiological roles. For example, omega-3 fatty acids, anti-inflammatory, help reduce inflammation, while omega-6, proinflammatory, tend to provoke. Therefore, the daily dietary intake of omega-3 and omega-6 are essential to that balance. In a balanced diet, the omega-6 fatty acids must be at most 5 times greater than that of omega-3 fatty acids. 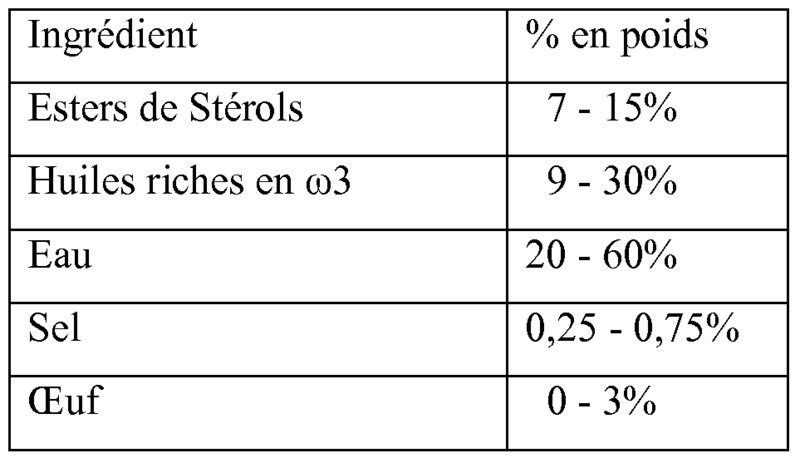 Based on the results observed by various scientific groups, AFSSA (French Agency for Food Safety) and EFSA recommends a daily intake of omega-3 fatty acids of between 2 to 3 g.
However, according to the report of AFSSA, the French consume an average of between 0.30 to 0.50 g of alpha-linolenic acid per day and the omega-6 / omega-3 medium sometimes rises up to 11. Faced with this deficit in omega-3 fatty acids in the Western diet, the public health authorities therefore recommend the consumption of foods naturally rich or enriched in omega 3 fatty acids such as vegetable oils (rapeseed) or fatty fish. High blood pressure (hypertension) is permanently elevated counts of blood pressure (blood pressure or said TA) over 16 / 9.5. The role of salt in the development of hypertension is revealed by Dahl in the sixties. A positive correlation between the prevalence of hypertension and salt intake, was subsequently confirmed by later studies. It has been shown that high levels of salt in the blood can increase the pressure on the blood vessels because salt increases blood circulation volume. In response to this stress pressure, blood vessels become thicker and narrow. This physiological reaction restricting blood flow in the vessels, causes an increase in blood pressure to increase this rate. In conclusion, a high level of salt in the blood can trigger a positive feedback between increased blood pressure and decreasing the diameter of the vessels. In other words, excessive intake of salt can worsen the situation of a person already suffering from high blood pressure. The physiological need for salt in a human is about Ig per day. However, according to AFSSA report in 2002, the daily intake of salt in a western diet reaches up to 10 g per day, this amount far exceeding the amount needed. 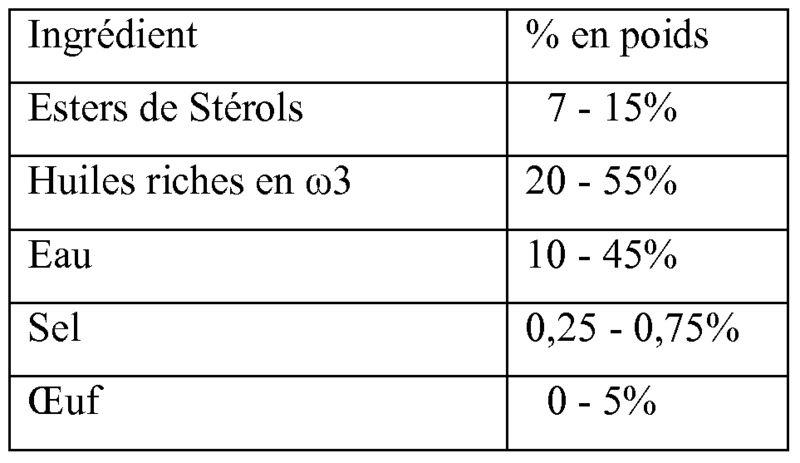 Therefore, the PNNS (Program National Nutrition Santé) recommends limiting salt consumption in the French population. (Study INCA). Limit salt content in these food products is an important aspect to be considered in order to effectively reduce the daily consumption of salt. Currently on the market there are already food aimed to reduce the blood cholesterol or food products for sodium diet. So EP 0828434 describes a food product containing polyunsaturated fatty acids and phytosterols, said product giving a synergistic effect to reduce cholesterol. In the market, there are already margarines with added phytosterols, rich in omega 3 and low levels of salt for several years. But for margarines, it is inverse emulsion: water-in-oil, whereas for the composition of the present invention there is oil in water emulsion. However, while KR 2001 0007979 describes a salad dressing may prevent hypertension and high cholesterol, which contains 0.01 to 0.1% chitosan and does not contain phytosterols, no salad dressing currently offered on the market is intended to act simultaneously on the two main factors of cardiovascular risk - vascular. The object of the present invention is to provide a food composition in the form of a stable oil in water emulsion having low levels of salt for a profit on blood pressure, enriched in Omega 3 for proper cardiovascular function and phytosterol to lower cholesterol. Said food composition gives an effect of reducing the risk of cardiovascular disease by acting simultaneously on two main factors, that is to say, high cholesterol and hypertension, after a regular daily consumption. Also, the object of this invention is a food composition as a stable emulsion and continuous oil in water, capable of being preserved at room temperature comprising phytosterols in free form or esterified oils naturally rich in fatty acids omega-3 and 0.25% to 0.75% by weight of salt. Advantageously, the amount of salt is 0.5% by weight. The amount of salt is calculated on the total weight of the final product and salt added in food composition and salt content in the ingredients used in the food composition, such as mustard or condiment vegetables. By "room temperature" in the sense of the present invention is meant that the temperature is between 4 ° C to 25 ° C.
More particularly, the food compositions of the present invention preferably comprise 14% by weight of phytosterols based on the total weight of the final product. By "phytosterols" refers to phytosterols, that is to say sterols or stanols are present in free or esterified form. In a preferred embodiment, between 95% to 99% of the phytosterols present in the food composition are esterified phytosterols. In a preferred embodiment, the food composition of the present invention comprises from 5 to 70%, preferably 10 to 30% of oils naturally rich in omega-3 fatty acids, calculated on the total weight of the final product. The natural oils rich in omega-3 fatty acids are chosen especially from fatty fish oils, flaxseed oil, canola oil, soybean oil, wheat germ oil and oil camelina. The food composition of the present invention may further comprise additives such as thickeners, colorants, flavors, antioxidants, stabilizers, preservatives, acidifiers and emulsifiers conventionally used in the field. In specific embodiments, the food composition of the present invention may further include ingredients such as sugar, vinegar, pepper, mustard, eggs, olive oil, walnut oil, vegetables in Vinegar (capers, pickles, garlic), tomato, fruit or vegetable juices, dairy ingredients and essential oils. The pH of the composition is advantageously between 2.5 and 4. It is in the form of a stable oil in water emulsion and the particle size is between 2 and lOOμm. The food composition of the present invention can be a salad dressing, salad dressing, mayonnaise or a variety of sauce. By variety of sauces, means all cold sauces to accompany meat and fish, and include for example, Burgundy sauce, aioli, and grout. The food composition of the present invention, naturally rich in omega 3 fatty acids (food composition 100g can cover 30% of the recommended daily intake of omega 3 fatty acids, recommended daily intakes set to 2g / day) may provide a daily dose at least 1.6 g of phytosterols and less than 0.15 g salt per day. In a particular embodiment, the food composition of the present invention is presented in a single dose package corresponding to a daily portion, the single-dose packaging which may be a metered dose vial, a sachet or a cup. The food compositions of the present invention can be made according to techniques and manufacturing processes known in the art. The composition according to the invention exhibits excellent storage stability and shows no phase separation at room temperature. The emulsion retains its physicochemical and nutritional characteristics throughout its lifetime ie 9 months. These products can further comprise profit organoleptic ingredients at large, such as mustard, herbs, spices, sugar, tomatoes, vinegar, lemon juice etc. These products can further comprise thickeners, acidifiers, antioxidants, preservatives, etc. These products can further comprise profit organoleptic ingredients at large, such as mustard, herbs, spices, sugar, tomatoes, etc. 1. A food composition in the form of a stable emulsion and continuous oil in water, capable of being stored at room temperature comprising phytosterols in free form or esterified oils naturally rich in omega-3 fatty acids, and between 0.25 % to 0.75%, preferably 0.5% by weight of salt, based on the total weight of the final product. 2. 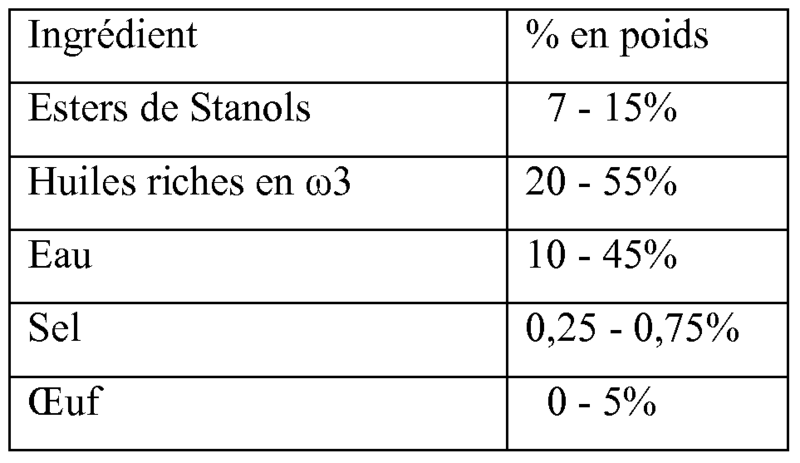 Food composition according to claim 1, characterized in that it advantageously comprises 14% by weight of phytosterols based on the total weight of the final product. 3. 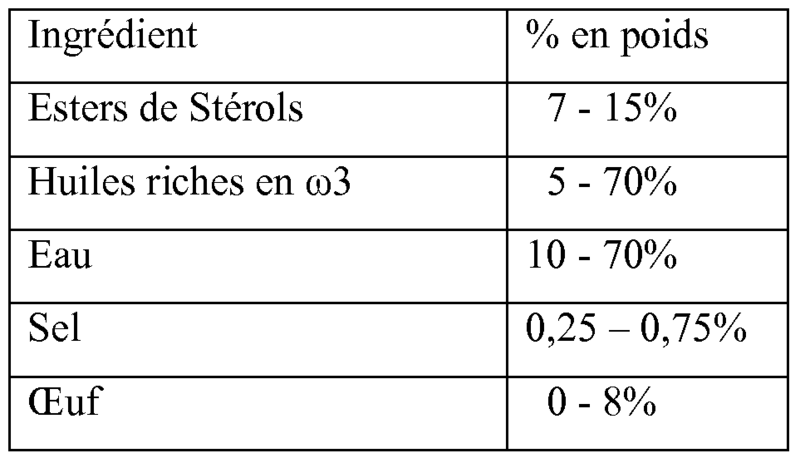 A food composition according to claim 1 or 2, characterized in that the esterified phytosterols represent 95% to 99% phytosterols present in the composition. 4. Food composition according to any one of claims 1 to 3, characterized in that it comprises from 5 to 70%, preferably 10 to 30% of oils naturally rich in omega-3 fatty acids, calculated on the total weight of the final product. Food 5. Composition according to one of claims 1 to 4, characterized in that the natural oils rich in Omega-3 fatty acids are selected in particular from fatty fish oil, linseed oil oil rapeseed, soybean oil, germ oil, wheat or camelina oil. 6. Food composition according to one of claims 1 to 5, characterized in that it further comprises additives such as thickeners, colorants, flavors, antioxidants, stabilizers, preservatives, acidifiers and emulsifiers. 7. Food composition according to one of claims 1 to 6, characterized in that it comprises further ingredients such as sugar, vinegar, pepper, mustard, eggs, olive oil or walnut oil, vegetables in Vinegar (capers, pickles, garlic), fruit or vegetable juice, essential oils, dairy ingredients or tomato. 8. Food composition according to one of claims 1 to 7, characterized in that it is selected from salad dressing, salad dressing, mayonnaise, various sauces. 9. A food composition, naturally rich in omega 3 fatty acids, according to one of claims 1 to 8, characterized in that it provides a daily dosage of at least 1.6 grams of phytosterols and less than 0.15 g salt. 10. A food composition according to claim 9, characterized in that it is presented in a single dose package corresponding to a daily portion. 11. A food composition according to claim 10, characterized in that the single dose package is a metered dose vial, a sachet or a cup. ES2205701T3 (en) 2004-05-01 food products based on fats.